The Multi-Products Company of Oak Park, Michigan was well-known in the 1950s for its line of mobile amateur products. 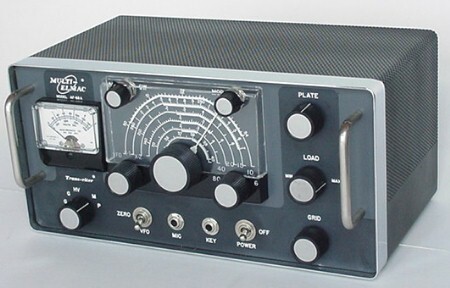 This AF-68 AM/CW transmitter was made in 1960 and was preceded by the A54 and AF-67. It was frequently paired with the PMR-8 mobile receiver. The AF-68, called a "trans-citer" by Multi-Elmac, was a 9 tube VFO-controlled six band (80-6 meters) AM/CW transmitter or exciter. It was sometimes called the "poor man's Ranger," in reference to the famous and more costly E.F. Johnson Viking Ranger, which it functionally resembled. Although the AF-68 lacked a built-in power supply, the versatile M-1070 AC/DC supply (below) was available as an option, which made the AF-68 better suited than the Ranger for mobile operation. 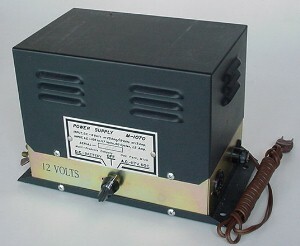 The fixed 115VAC supply (model PS-2V) was another available option. Devotees of the AF-68 often preferred it to the Ranger and claimed that the AM fidelity was superior. This M-1070 power supply could be used either on 120VAC and 6 or 12 V DC (jumper selected). It provided filament voltages, 500V, 250V, and 105V (regulated). 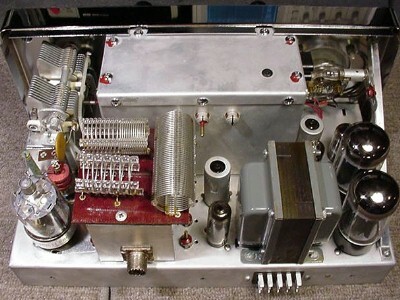 Circuit Description: The nine-tube lineup consisted of a 6AK6 VFO/xtal oscillator, driving a 6AG5 buffer-multiplier, a 6AQ5 driver, and a 6146 final amplifier. Audio was provided by a 6AU6 speech amplifier, a 12AU7 audio driver, and a pair of 6L6GB modulators. A 500 ohm tap on the modulation transformer was brought to the power connector for driving the grids of a high-power modulator. The wide-range pi-network could tune 50-300 ohms. One oddity of the AF-68's design was the use of a 22.5V bias battery for the 6L6GB modulators. Although the current drain on the battery was negligible, the shelf-life was not, and collectors (including yours truly) often modify the circuit to use a zener diode. Just try buying a 22.5V battery at your local Radio Shack! Another weak link in the design was a failure-prone audio driver transformer with fragile hair-like wires. Most remaining AF-67s and AF-68s have replacement driver transformers. The 6146 tank circuit used a Pi-network with dual-section tune and load capacitors. Sections were ganged to the bandswitch. This top photo of the transmitter shows a compact, but uncluttered layout. The large VFO compartment contains the 6AK6 oscillator, which has switched outputs on 3.5-4.0 MHz, 7.0-7.5 MHz, and 12.5-13.5 MHz. Performance and Operating Impressions: As mentioned in the accompanying PMR-8 receiver page, this AF-68 was unused when I acquired it in 1999. 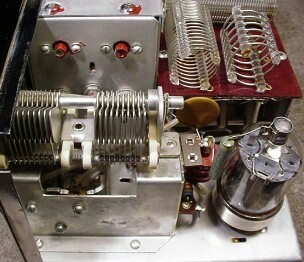 Although unused, the transmitter had several problems: an open winding in the audio interstage driver transformer (a very common problem with the AF-67 and AF-68), a loose connection to the ten-meter tank coil, and a sticky meter. Fortunately, these problems were easily fixed, and I soon had the rig on the air. I found the tuning to be very straightforward, with excellent VFO stability. Audio reports have been quite complimentary, and the CW note is smooth and chirp-free. The cryptic markings on the multimeter switch, which has two positions identically marked with the letter "G" take a bit of getting used to, but all-in-all the radio is easy to use. The AF-68 is quite a handsome transmitter, with its two-tone gray front panel and chrome handles. I prefer the styling to that of either the Viking Ranger I or Ranger II. Click HERE to go to the PMR-8 Receiver page.